What is “society in harmony with nature”? It means society in which humans can live with nature, blessed with biodiversity and ecosystem services. The term was first defined in the strategy “Becoming a Leading Environmental Nation in the 21st Century”, which was approved in a 2007 cabinet meeting, as a vision for society in Japan along with “low carbon society” and “sound material-cycle society”. In the strategy, it was emphasized that sustainable society should be realized through the integration of these three social visions. Now, the direction for sustainable society, including society in harmony with nature, is specified in the Basic Environmental Plan and National Biodiversity Strategy, which present the frameworks for environmental policies. 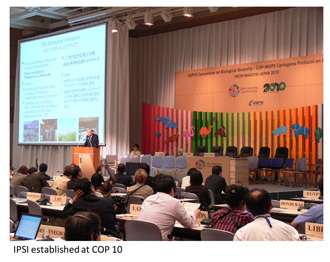 The Satoyama Initiative was proposed in “Becoming a Leading Environmental Nation in the 21st Century” as an initiative for Japan to introduce to the world at the tenth meeting of the Conference of the Parties to the Convention on Biological Diversity (CBD COP 10), which was going to be held in Nagoya, Aichi, Japan in 2010. The Satoyama Initiative is an effort to realize society in harmony with nature for people throughout the world by integrating traditional wisdom such as that found in Japan’s satoyama landscapes with modern knowledge and frameworks for resource management. At CBD COP 10, the Aichi Biodiversity Targets, 20 short-term targets to be achieved by 2020, were adopted in order to halt the deterioration of biodiversity and ecosystems, along with the Nagoya Protocol on Access and Benefit-sharing. Also, “a world of ‘Living in harmony with nature’” was proposed as a long-term target to be achieved by 2050, the realization of society in harmony with nature was asserted as a world goal, and the Satoyama Initiative was recognized as an effective approach for the sustainable use of biological resources. However, the Satoyama Initiative was not easily accepted by international society. Some were especially resistant to recognizing the word “Satoyama” as a common concept throughout the world, as it comes from the Japanese language. This led to the idea of Socio-ecological Production Landscapes (SEPLs) being proposed as a common concept worldwide, with the name “Satoyama” kept for the Initiative, and this was supported by a majority of the parties. 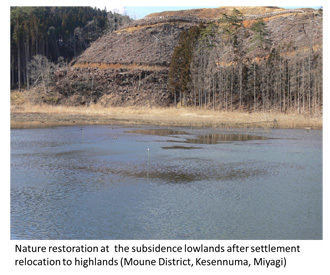 The concept of SEPLs was first proposed in the “Japan Satoyama Satoumi Assessment”, conducted using the framework of the Millennium Ecosystem Assessment (MA). In COP 10 meetings, some major agricultural exporting countries made the criticism that the Satoyama Initiative would augment local production for local consumption, and thus inhibit free trade in goods in the spirit of the GATT Uruguay Round. However, the Initiative received strong support from not only Asian but also African countries, and it was finally included in the COP 10 decision on “Sustainable Use of Biodiversity”. The International Partnership for the Satoyama Initiative (IPSI) was also formally established at that time. IPSI was first proposed by Japan’s Ministry of the Environment and the United Nations University Institute for the Advanced Study of Sustainability (UNU-IAS). The partnership was launched with 51 founding members at CBD COP 10 in 2010 and had expanded to 164 members when the Fifth IPSI Global Conference (IPSI-5) was convened back-to-back with CBD COP 12 in Pyeongchang, South Korea in October 2014. The 164 members include a variety of institutions such as international organizations, national governments, local governments, universities, private-sector firms and NGOs. IPSI provides a place for information sharing and discussion as well as promoting collaborative activities among members. I would like to make three points regarding ways for the Satoyama Initiative to realize society in harmony with nature. First, it is necessary to strengthen the resilience of local societies by making use of traditional knowledge and ecosystem functions. Modern agriculture, forestry and fisheries are highly productive, but vulnerable to changes. It is important to take measures to strengthen social and ecological resilience toward long-term changes like climate change and short-term changes like extreme climate events. To help measure and enhance community resilience, Indicators of Resilience in Socio-ecological Production Landscapes and Seascapes (SEPLS) have been jointly developed as a collaborative activity within IPSI. Second, it is necessary to create new commons. Traditional and socio-ecological production landscapes like satoyama landscapes have been maintained through institutional mechanisms such as communal land and co-management systems for water use. However, in the process of modernization, such frameworks of commons have been greatly damaged. The creation of new commons means efforts to promote the participation of diverse stakeholders including local governments, private sector, NPOs, and citizens in order to form new resource-management governance appropriate to modern societies. Third, it is necessary to construct new business models making use of natural capital. Mass-produced agriculture, forestry and fisheries are efficient, but inconsistent with the realization of society in harmony with nature as they damage natural capital and bring environmental destruction. The promotion of high-value-added agriculture, forestry and fisheries making use of natural capital is required for the realization of society in harmony with nature. In addition, social-system innovation is necessary to enhance the revitalization of declining regions through a combination of renewable energy use and eco-tourism. The Great East Japan Earthquake on 11 March 2011 reminded us of another aspect of nature that can occasionally threaten our lives: natural disasters. The “National Biodiversity Strategy of Japan 2012-2020”, which was formulated after the earthquake in 2011, proposed that we should build safe and secure societies based on the understanding that nature provides rich blessings but sometimes represents big threats, and that we should re-construct the rich relationship between humans and nature by re-evaluating the traditional agriculture, forestry and fisheries found in satoyama and satoumi landscapes. Such ideas are embedded in the concept of the “Sanriku Fukko (Reconstruction) National Park”, established in May 2013, and the “Green Reconstruction Project” aiming at its realization. People can experience the rich relationship between humans and nature at the “Satoyama Satoumi Field Museum” and the “Michinoku Coastal Trail”, which has a total length of about 700 km. In the coastal zones, new projects are being carried out to enhance disaster prevention and disaster risk reduction by strengthening regional resilience, making use of ecosystem functions such as nature restoration in wetlands and coastal forests. Disaster prevention and disaster risk reduction using ecosystem functions will be discussed at the United Nations World Conference on Disaster Risk Reduction to be held in March 2015 in Sendai, Japan. Based on results produced at the The 1st Asia Parks Congress held in Sendai in November 2013 and the IUCN World Parks Congress, held in November 2014 in Sydney, Australia, I will make a recommendation regarding society in harmony with nature allowing for adaptive response to natural disasters. I think that such a recommendation will also be effective as a measure against climate change. Efforts to realize society in harmony with nature have been conducted all over the world through the enhancement of resilience in regional societies, creation of new commons and the development of new business models making use of natural capital. The creation of society in harmony with nature is the most important theme for attaining sustainable development, especially in developing countries suffering from various kinds of environmental deterioration exacerbated by population increase. Worldwide sustainability largely depends on the realization of society in harmony with nature. 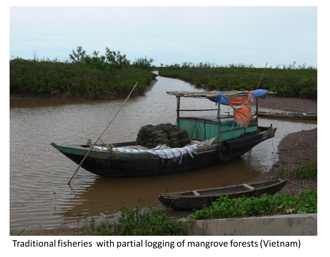 In areas around the mouth of the Red River in the northern part of Vietnam, where we have conducted research, traditional fisheries using ecological functions with partial logging of mangrove forests has proven to be much more sustainable and cost-effective than shrimp farming involving clear-cutting of mangroves. Where the growth of modern rice varieties was poor due to progressive salinization, cultivation of indigenous sticky rice varieties and rush species proved to be more appropriate. In these ways, the utilization of traditional fisheries and agriculture strengthens local resilience. Likewise, in semi-arid areas in the northern part of Ghana where we are conducting research now, adverse effects on agriculture and livelihoods of the local people are serious due to aggravated droughts and flooding that come with climate change. Diversification of cultivars for agricultural products in order to adapt to these environmental changes and the promotion of processing and distribution to add value to agricultural products have been investigated. 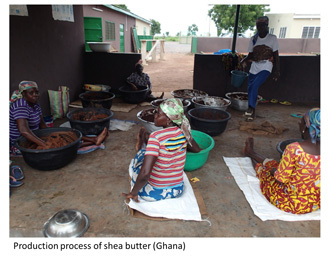 As shea trees, which are an essential income source for women, are highly adaptive to environmental changes, improved measures of processing and distribution have also been explored. 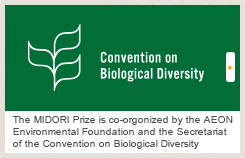 In the autumn of 2014, it was announced that Prof. Alfred Oteng-Yeboah, advisor of this project and the Chair of IPSI’s steering committee, had received the MIDORI Prize for Biodiversity, and we had a little celebratory gathering at the congress held in Accra, Ghana in September. We also had a celebration dinner with Japanese parties at COP 12 in Pyeongchang. It seems to me that this award serves as proof to the world of the widespread inclination toward society in harmony with nature and IPSI’s progress in promoting it. Kazuhiko Takeuchi is Senior Vice-Rector of United Nations University, Director and Professor of the Integrated Research System for Sustainability Science (IR3S) at the University of Tokyo. He has served, inter alia, as a member of the Science Council of Japan, and a vice-chairman of the Food, Agriculture and Rural Area Policies Council, Government of Japan, Editor-in-Chief of the journal Sustainability Science (Springer). Educated and trained as a geographer and landscape ecologist at the University of Tokyo, he engages in research and education on creating eco-friendly environments for a harmonious coexistence of people and nature, especially focusing on Asia and Africa. He leads the Satoyama Initiative as well as climate/ecosystem change research in Asia and Africa. His recent publications include Rebuilding the relationship between people and nature: The Satoyama Initiative (Ecological Research, 25, 891-897, 2010), Sustainability: Engaging in global change thorough harmonious adaptation in Asia (co-authored, Nova Acta Leopoldina, NF112, Nr. 384, 213-226, 2010), Sustainability Science: A MultidisciplinaryApproach (co-edited, United Nations University, 2011), and Satoyama-Satoumi Ecosystems and Human Well-Being: Socio-Ecological Production Landscapes of Japan (co-edited, United Nations University, 2012), Using sustainability science to analyse social–ecological restoration in NE Japan after the great earthquake and tsunami of 2011(co-authored, Sustainability Science 9: 513-526, 2014). *Following terms mentioned in this column are linked to the pages of the Ministry of the Environment, Japan. Strategy for an Environmental Nation in the 21st Century (PDF), The Basic Environment Plan, The National Biodiversity Strategy of Japan, Green Reconstruction Project (PDF), and Green Reconstruction Project (PDF).